Brazil and the United States may have settled, for now, their long-running WTO dispute over U.S. cotton subsidies, but the issues it raised remain. After all, Brazilian producers were not the only ones hurt by U.S. dumping of its highly subsidized cotton on world markets, which not only took market share from competing producers, it depressed the international price for all producers. How much does agricultural dumping cost farmers in developing countries? I recently completed a study for a Woodrow Wilson Center project that highlights just how high the cost of dumping can be. I benefited from the somewhat controlled experiment represented by U.S.-Mexico agricultural trade under the North American Free Trade Agreement (NAFTA). I call it a controlled experiment because NAFTA liberalized agricultural trade dramatically over a short period of time, Mexico imports most basic grains and meats almost exclusively from the United States, and Mexican farmers grow many of the crops that compete with the imports. In such a case, one can easily see the increase in U.S. exports, the drop in Mexican producer prices, and it is reasonable to assume that the U.S. export price is the reference price for these products in Mexico. Using one of the definitions of dumping listed by the WTO (GATT Article VI Sec. 2.2), we estimated the extent to which U.S. export prices to Mexico were below U.S. farmer costs of production (plus transportation and handling). We looked at the nine-year period 1997-2005. We began in 1997 because NAFTA’s agricultural provisions were mostly implemented and the 1996 U.S. Farm Bill, which had a price-depressing effect on most major crops, had taken effect. We ended the period in 2005 to avoid the confounding effects of the speculative commodity price boom, which began in late 2006. 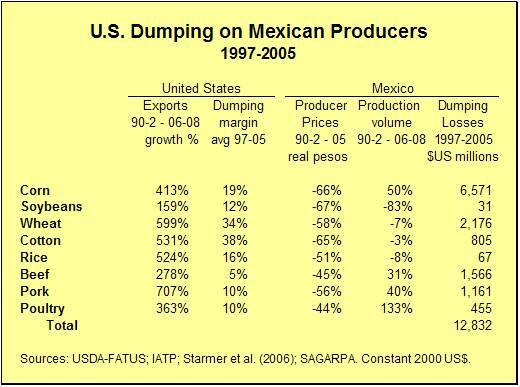 We simply calculated the extent to which Mexican producer prices were lowered by U.S. dumping, and then estimated how much more Mexican producers would have earned if they had received non-dumping prices – at least high enough to cover U.S. costs of production. The eight products studied all saw significant growth in U.S. exports, from the 159% increase in soybean exports to the 707% increase in pork exports. All eight products showed positive dumping margins – 5-10% for the meats, 17-38% for the crops. For all eight products, real producer prices in Mexico fell dramatically, with real 2005 prices 44%-67% lower than their levels in the early 1990s. Mexican production fell for all the crops except corn, and rose significantly for meats, reflecting the rising demand for meat-based protein in the Mexican diet. Import dependency increased dramatically for all products. What was the cost to Mexican producers of these dumping-level prices? We estimated the nine-year cost at $12.8 billion (in 2000 US$), $1.4 billion per year. To put these numbers in context, the annual losses are more than 10% of the value of all Mexican agricultural exports to the United States (including beer, which Mexico, oddly, classifies as its most important agricultural export). The losses from U.S. dumping surpass the total value of Mexico’s annual tomato exports to the United States, widely touted as Mexico’s biggest NAFTA success story in agriculture. Not surprisingly, corn farmers suffered the highest losses. U.S. exports increased 413%, arrived at prices 19% below production costs, and real producer prices in Mexico declined 66%. We estimated losses to Mexican corn farmers of $6.6 billion over the nine-year period, over $700 million per year. These losses amount to $99/hectare per year, a crushing blow to struggling smallholders. Given how sluggishly the Mexican economy has performed under NAFTA, these are also crushing losses for Mexico. An estimated 2.3 million people have left agriculture in a country desperate for livelihoods. 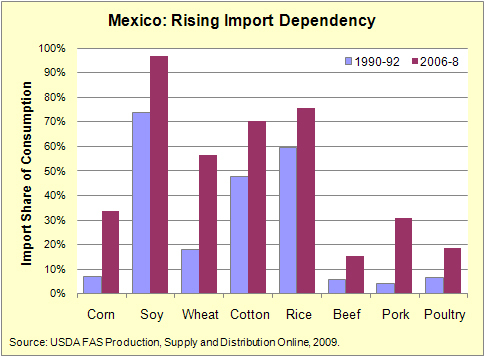 (See our report, “Rethinking Trade Policy for Development.”) And food dependency has risen dramatically (see graph), which cost Mexico dearly when commodity prices spiked in 2006-8. Mexico certainly serves as a warning to developing countries considering agricultural trade liberalization. The case also highlights the weakness of international rules for defining and disciplining agricultural dumping. That weakness, and the vulnerability of developing-country farmers to import surges, makes all the more reasonable developing-country demands in the stalled Doha Round negotiations for strong Special Product measures to protect key food crops and effective Special Safeguard Measures to protect against import surges. Until agricultural dumping can be disciplined effectively, developing countries must retain the policy space to defend themselves. Mexico gave up most of its defenses under NAFTA. Farmers are paying a high price. 1. What can be said about the extent of agricultural dumping globally? and the type of products in volume and in value, as well as figures showing the consequences in different developing countries? and instead produce goods the world needs more of, such as biofuels? but generate lower revenue for the farmer, compared to other agricultural products? Is it possible to change this by subsidizing biofuels? b) Inertia / friction in production and in the markets. c) The lack of global coordination and global governance. I Would very much appreciate a reply. Good questions. I have only brief answers, from the field at the moment. In terms of measuring dumping internationally, the measures are poor. The WTO has no consistent and easy to apply measure of dumping, except in obvious cases in which a country is exporting at prices that are clearly below those charged domestically or to other export markets. See current EU dairy exports for a good example. The standard I use – exporting at prices below production costs – requires widely accepted and reliable data on what constitutes production costs. Some NGOs have proposed the development of such a standard, but it has not been taken up. As for shifting production toward biofuels, be careful. Many are actually not sustainably produced, and land use can take production away from needed food production in developing countries. The key, I believe, is to shift away from overproduction in the global North by more careful government efforts to balance supply and demand, keeping prices above dumping levels, and at the same time to stimulate food production in developing countries with a focus on meeting domestic demand rather than relying so heavily on imports. New attention to public investment in smallholder food production in developing countries is very welcome. If you were rational what are these different grades of Language of switzerland Rolex Online all about and that if these remarkable watches were available in different grades, be fitted for a surprise. We are not talking about the veritable Rolexes but we are discussing about the swiss language duplicate watches that are available online and are just referred to as swiss language rolex watches. Language of switzerland watches are remarkable all more than the universe for the faithful and neat timepieces, hence it is not bewildering to see that the Language of switzerland Rolex online watches are not the only brand of duplicate watches and there are other brands available too like the ever-popular swiss language omega watches. Now let us deliberate a bit about the grades of these Language of switzerland Rolex Online. Your data is only stored on the secure servers supplied by Mozy. ever. To access the online backup services program. website along with guides, troubleshooting tips and more. Advanced statistics back up that theory. Exports shipped at prices below the cost of production from a large exporting country create an unfair trading advantage, because they depress international prices and narrow the market opportunities for other producers.